Most Texas auto insurance providers offer a premium discount (usually 10%) for a 3-year period to any driver who successfully completes a defensive driving course. Since the 1970's, millions of drivers have taken advantage of this great savings opportunity by choosing DTA's Texas defensive driving program. This course is fully approved by the State of Texas. Our course provider number is CP-090. The online driving safety course can also be taken voluntarily once a year to dismiss a Texas traffic citation. Am I Eligible To Attend This Course? If you intend to take this course for the insurance discount, we recommend that you check with your insurance company first to be sure you are eligible and to find out their discount rates and procedures. If your insurance company needs to know which course you are taking, you can tell them it's Driver Training Associates' Program for Driver Improvement. Our TEA-assigned course provider number is CP-090 and our course is approved by the Texas Board of Insurance for premium reduction. If you wish to take this course for Texas ticket dismissal, click here for eligibility requirements. If you attend the course for ticket dismissal, you will still receive an insurance discount certificate that you can turn in to your insurer. Sign up for the course – Click the register button, fill out the short registration pages, and pay for the course. Pass the exam – There is a 20-question final exam at the end of the course on the material you just learned. You have three opportunities to pass. Send in your certificate – After you pass the course, DTA will mail your completion certificate to you. 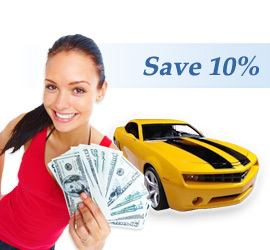 Send the certificate in to your insurance company to receive your discount. It's that easy! Just click on the button below to get started.